I have always said that I hate beets. Granted, the only experience I had ever had with them were the canned Del Monte variety. That metallic taste, the mushy texture, the weird color, everything about them turned me off. In the last year or so I have discovered that not only do I like beets, but I love them. 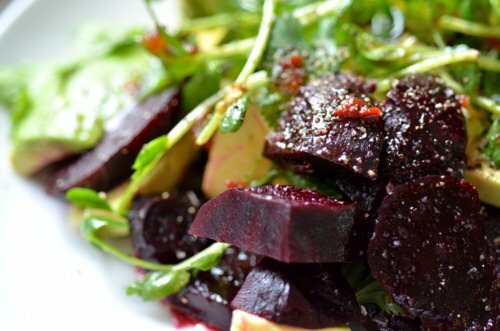 Roasted, pickled, or raw, beets are incredibly diverse, easy to prepare and delicious. I found the recipe for this salad on the Guardian news website. They have this amazing series called the new vegetarian that has some of the most original and innovative dishes I have seen in a long time. I am slowly trying to make my way through them. The salad is really simple and there are lots of ways to make it easier to prepare. Don’t have time to roast beets? Trader Joe’s has prepared beets in their produce section, so you have no excuse not to try this salad. I’ve made it with thinly sliced onion and fava beans but I find this version to be quicker and the ingredients are super easy to throw together with minimal time. The dressing is a great combination of sweet and spicy and with the addition of the avocado it’s super satisfying. 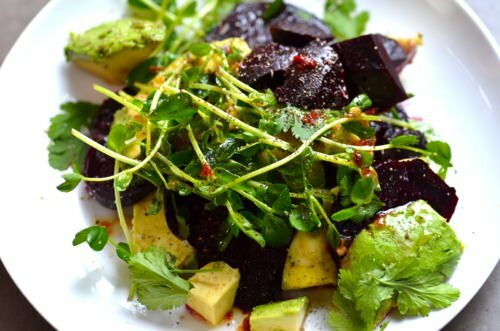 So if you are on the fence about beets I hope that you’ll try this salad, it might just change your mind. Pre-heat the oven to 375 degrees. Place the beets on a large piece of aluminum foil and sprinkle with a drizzle of olive oil, salt and pepper and fold the foil into a packet. Roast the beets for 25-50 minutes depending on their size. Let them cool slightly and then peel the skins off with your fingers or a small paring knife. (Beware that the beets with stain your skin, use a paper towel to rub the skins off if don’t want red fingers) Thinly slice the beets and place them in a bowl. Add the vinegar, oil, sugar, chili paste, salt and pepper in a bowl with the beets and toss to coat. Let the beets marinate for a few minutes to let the flavors develop. When you are ready to serve, spread half the beet mixture onto a plate. 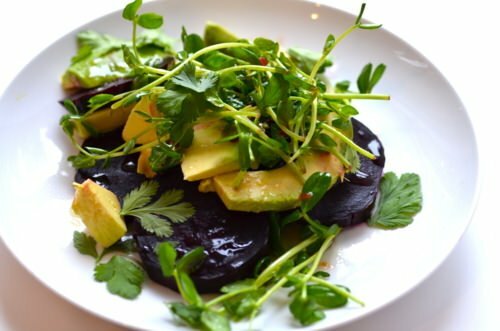 Slice the avocado and place half on top of the beets along some of the pea shoots and cilantro. 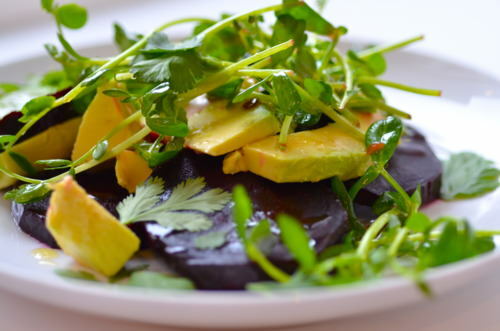 Place the rest of the beets on top and finish with more avocado, pea shoots and cilantro.